What to do after AP? Build and test simple dye-sensitized solar cells! Not sure what to do after the AP chemistry exam? Have you considered having your students make solar cells? If your AP kids can understand batteries, solar cells are a logical next step. I usually do independent projects after AP along with final presentations, but I stumbled upon this activity the other day and my mind exploded in excitement and thought I would share. In the future, I would definitely do this with my students! Renewable energy is all over the news now, and rightly so: it is vital necessity for the growing energy needs of our society. 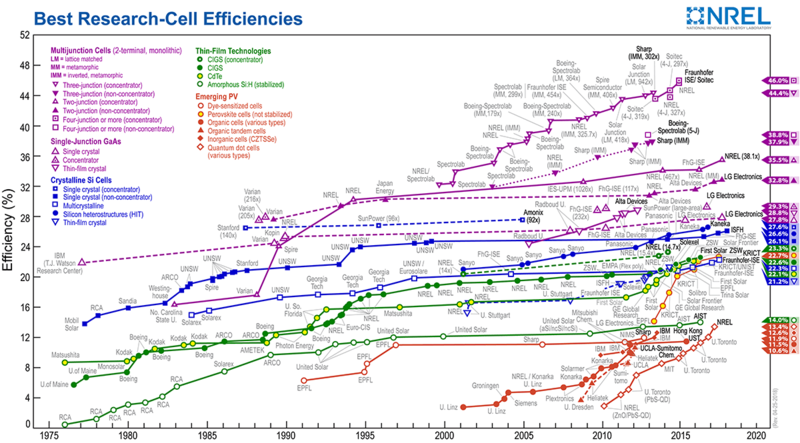 There are a variety of solar cells both on the market and in research. A chart of record efficiencies as put together by the National Renewable Energy Lab in Golden, CO will give you the sense of the scope of work being performed all over the world. The specific mechanism of operation varies greatly based upon material. For instance, in a silicon solar cell, p-type and n-type silicon are sandwiched together. In emerging photovoltaics (PV), there are multiple layers of material. All of this is to create a system that allows current to flow in one direction (create a diode). In general, a dye-sensitized solar cell (DSSC) works analogously - electrons must flow in one direction to make a current. Light goes in and is absorbed by a dye. This creates an Coulombically-bound electron-hole pair (exciton) (a hole is simply the absence of an electron). The exciton diffuses and eventually splits. This leaves a hole (cation dye) behind and an electron that travels through titania (TiO2). The architecture of the device allows for electrons to flow in one direction through the circuit while at the same time, hole (cation dye) regains an electron via a redox reaction with iodide. Once you have regenerated the neutral dye, this cycle can happen over and over again with electrons flowing through a circuit. A much better explanation (with pictures!) can be found here and here. What dye will you use with your students? Raspberry juice. Yep, raspberries. The original source for fabrication and testing with undergrads/high school students is found in a 1998 J. Chem. Ed. article written by Grätzel himself, one of THE pioneers in DSSC (and other photovoltaics). Here is a 2013 J. Chem. Ed. (Subramanian et. al.) article to source needed TiO2 from toothpaste. Subramanian et. al. were kind enough to put the fabrication in the supporting information, which is free to all. Here is yet another prep from the University of Wisconsin-Madison, and their great youtube video to help visualize the fabrication of devices and testing. However, the link they cite to purchase kits does not work, so if you have the means, you can purchase kits with all the supplies from Arbor Scientific (who recommends blackberries...why not test raspberries and blackberries to see which creates the highest voltage cell?). As I said, my mind is exploding with project ideas for students to engage as creative scientists after the AP exam. Source of TiO2 (toothpaste method vs. purchased vs. other TiO2 source)? Raspberries vs. blackberries vs. just a dye you have lying around the lab, like crystal violet? Concentration (or number of drops) of iodine (used to supply electrons via redox reaction your students likely saw prepping for AP exam)? I would have all of my students fabricate and test the original raspberry cell and then have them choose a variable to test so every group gets something that works. In short, please respond below if you have done this with your students and how it went. Materials, supplies, background information and information on preparing the paste can be found on the MRSEC Education Group website. A kit that contains the supplies (conductive glass, nanocrystalline TiO2, binder clips, KI electrolyte, manual, etc.) to create five titanium dioxide raspberry solar cells can be ordered from the Institute for Chemical Education. The kit contains enough nanocrystalline titanium dioxide to be used many times. The preview graphic is adapted with permission from Demonstrating Electron Transfer and Nanotechnology: A Natural Dye-Sensitized Nanocrystalline Energy Converter, Greg P. Smestad and Michael Gratzel, Journal of Chemical Education, 1998 75 (6), 752. DOI: 10.1021/ed075p752. Copyright 1998 American Chemical Society. Figure 4. Assembled solar cell or detector showing offset glass plates, clips, and elec- trical contact points. The stained TiO2 layer is in contact with the carbon-coated conductive layer. Light enters the sandwich through the TiO2-coated glass plate, which is the anode of the electro- chemical device. How do you meet your students where they are at?